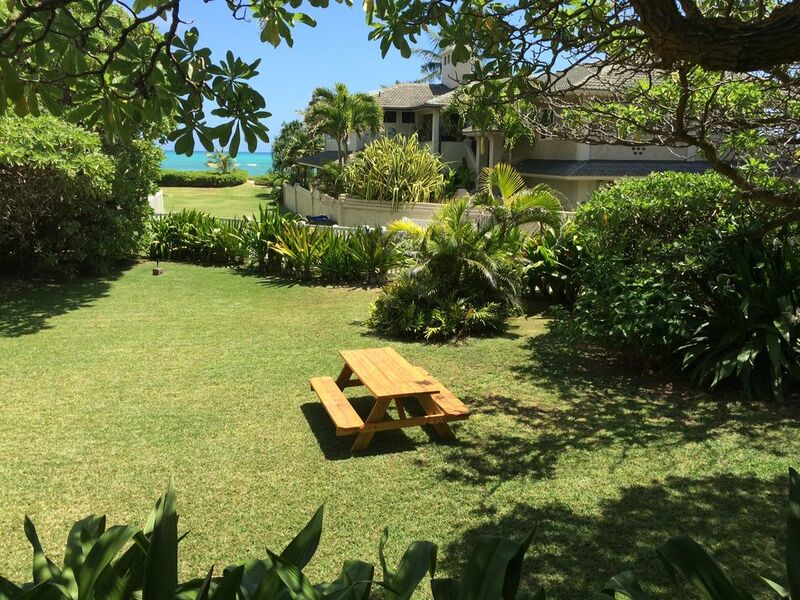 Duke's Beach Cottage is located on a private lane in a quiet, affluent neighborhood on beautiful Kailua Beach. Exclusive vacation rental has become available for romantic couples getaway. This is where the famous surfer and Olympian swimmer Duke Kahanamoku would come and relax. Enjoy the huge lanai, with ocean views and trade winds blowing. Private beach access is solely for the owners on the street and their guests. You are steps from the three mile, white sand beach with no shoreline reef perfect for surfing, paddleboarders and wind surfing. Duke's is maintained as a secondary home with extensive owner use. This is a smoke-free, pet-free residence with incredible views of the Mokulua Islands. Local restaurants, a grocery store in a small mall (Safeway) and a specialty wine/gourmet store are a short walk away. The 2 bedroom, 2.5 bathroom house plus outside shower is fully furnished with two dining areas, one inside and one on the lanai. There are contracted gardeners and pest control to service the home and yard regularly. Please remember that Kailua Village is a private community on a very beautiful Hawaiian island. Our goal is to provide an enjoyable and comfortable experience in paradise, and the home does sleep five (5) people. Out of respect for our neighbors, large get-togethers on the property are strictly prohibited. Contact booking agent for minimum stay requirements; voicemail and text: (323)487-DUKE. Bookings start @ $359/night for two people; and there is a $10/person charge per night for each additional person. Our local property manager will be around for necessities. Cozy and classic 1942 single family dwelling on a quiet beach with shore access. Sitting on swing under a classic organic polynesian tree watching and hearing the waves crash with the warm tropical breeze kissing your face. 2.5 bathrooms. Two indoor showers. One bathtub in master bathroom. Less then 2 minute walk to the beach guaranteed! Four seating on the inside and Four on the outside. Tropical plants and large grass area. Master Bedroom with Cali.King Bed, 32' flat screen LCD TV in Master, Second bedroom bunk with a twin on top and a full-size on the bottom + additional twin bed. Unlimited long distance calling to mainland USA, 39' LCD TV in living area, IHome speaker system for Ipod/iPhone, Weber Charcoal Kettle with charcoal briketts, Stainless steel cookware, Blender, Toaster, two Coffeemaker's, Rice Maker. Open traditional Hawaiian style kitchen with NO dishwasher. Beach chairs and Beach towels, Beach Umbrellas, Outdoor Shower, Children's beach toys, Graco baby cot plus a Cocsco Play Pen and high chair, Two vehicle parking in driveway. This property has contracted yard and pest maintenance. Perfectly located comfy cottage with incredible view! We relished our 12 nights at Duke's Cottage. Ample room for our family of 4 to spread out, sleep comfortably and laze around. The deck with that direct view to the water is, in our opinion, the house's best feature and where we spent most of our time when at the property. The house is well stocked (especially the kitchen) and we ate in most nights. You are two miles from the heart of Kailua which has everything you need. The house is a bit funky, feels a bit old style Hawaiian, and we loved it. There are some awkward steps between rooms so if you are with someone with mobility issues, this probably isn't the property for you. While the house is in a residential area, I felt the size, landscaping and orientation of the property provided us a lot of privacy. A less than one minute walk down a trail diagonally across from the property puts you right on the beach. If you're a walker, you'll enjoy the opportunity to stroll the entire beach, maybe even the full length and back (we figured it's about 5 miles round trip). Melody was easy to communicate with and even met us late at night upon arrival -- much appreciated. We will not hesitate to return to Duke's Cottage! We enjoyed our stay at Duke’s cottage. We enjoyed our stay. It was wonderful to sit on the deck and see and hear the ocean. We found the house very comfortable. However we had a handicapped person and entering the house and using bathrooms was very difficult. Also suggest screen doors on all doors since house is not air conditioned and need to be open to provide air circulation when it is hot. My family thoroughly enjoyed our stay at this lovely Hawaiian cottage. There is a beautiful view of the ocean from your front deck and a short walk to the beach. Beach chairs, towels and other extras were included and so handy. The property manager was easily reached by text and answered any questions quickly. Don’t look any further! This is the place. Our next visit to Hawaii we will absolutely stay here again. Only complaint is the WiFi is a little patchy and best reception is in the main living area. Great location! Steps from one of the best beaches in Hawaii! You cannot beat the location at Dukes! Steps to an amazing beach with few people. You really feel like you have the beach to yourself! This was our second time here, and we loved eating meals on the deck with the ocean view. The house does not have many frills, but the beds are comfortable it is a relaxing place to stay. If you want a Hawaiian vacation that is away from the crowds, this is the place to come! Overall a wonderful spot. Felt like old Hawaii. Only showered outside because the shower was so nice and grilled every night. Linens and house were clean, beds comfortable. All the amenities we needed. It was super hot, so at times felt the house didn't get enough air flow. That comes with visiting the island in July. Lovely stay for the family. Great Location! Quiet and Peaceful! This was a quaint older home just 2 houses from the beach. Able to see and hear the ocean and watch the sunrise from the front deck. This home is not modern, but makes you feel like you're in "old" Hawaii, the way it used to be. Nothing fancy, no AC, not a place to work on your PC and do business, but a place of relaxation and just kicking back. They have lots of fans to help keep you cool, even in the summer, along with the wonderful trade winds off the ocean. Property was very clean and well maintained. The Kitchen was well stocked and has all the necessary cooking amenities, again nothing fancy, but adequate. If there is anything you need, Melody, the manager, is great at getting it for you. She is a very attentive host. It was just the four of us, my husband and I and our 2 sons. We had the large Master bedroom with a great king bed (nice mattress and pillows--slept great). Our boys slept in the second bedroom with the twin bed and the full size bunk bed. Each room had its own bathroom. Then there was an extra full bath with shower out next to living room. The guys loved the outdoor shower. The right size home for a couple and 2-3 kids. Love Kailua too. I grew up around here so my heart is close to home here. For a small town, Kailua has a lot to offer. This home is located on the North side Kailua, but all the stores in the main part of town are about 2 miles south and Lanikai beach is 3 miles away...Kind of far to walk, but could rent bikes. We loved it and would definitely come back here.....Mahalo! Surfing, Stand up Paddle boarding, Kite surfing, Ocean Kayaking, Thursday Farmers Markets, Tourist attractions twenty five minutes away including Waikiki, Diamond Head, Pearl Harbor, Mokopu Lighthouse, Sea Life Park, one hour drive to the North shore. MONTHLY RENTALS AVAILABLE. There is a one time clean out fee of $200. Base rate $359 per night for two people. Each additional person add $10 per person per night (kids are people too). Maximum capacity is 5 persons per night registered. $359-$429 per night. Reservation is not confirmed without signed rental agreement.